Looking for an easier, more effective way to grow your email list? Rather than designing your website for hit-and-run readers — who visit and leave your site without taking action — our free and easy-to-use WordPress plugin helps you create an embeddable form to capture visitor contact information. Looking for more advanced sign-up tools? Our integrations with MailMunch and Privy provide a variety of interactive forms and analytics. We recently released a free plugin to collect visitor information right from your WordPress site. Constant Contacts Forms for WordPress helps you to build professional, mobile-optimized sign-up forms that automatically match the theme and style of your WordPress site. No matter how tech savvy you are, these forms are easy-to-create and customize — with no coding required. After downloading the plugin, you’ll select the fields you want to include based on the information that’s relevant to your business, including email addresses, first and last name, phone numbers, event sign-ups, and visitor feedback. If you’re a Constant Contact customer, you can connect your account so that the new emails you collect will automatically get added to your account. You can even create a new email list without leaving the plugin, so you can keep track of which contacts signed up from your website. For example, if you entice website visitors to sign up for your email list by offering a 10% off coupon, you can create a specific email list for website visitors and schedule an automated email to send to contacts that are added to that email list. Note: Constant Contact Forms for WordPress works for all domain-owned, WordPress.org sites. You don’t need a Constant Contact account. Learn more and download our new WordPress plugin here. If you’re looking for more advanced customization, look to our integration with MailMunch. MailMunch allows you to choose from different types of sign-up forms, including, Popup, Embedded, Top Bar, and Slide Box. Many of these forms are designed to jump out at visitors or grab their attention right before they leave your site. Financial consulting company, CPA for Freelancers®, uses a MailMunch Popup form on their website to connect with website visitors. “It’s been consistent since we launched the website and email marketing program that we’re getting 10-20 subscribers a week,” says Gaynor Meilke, community manager for CPA for Freelancers®. Learn more about MailMunch features and pricing here. Similar to MailMunch, Privy offers a variety of interactive email sign-up forms for your website. 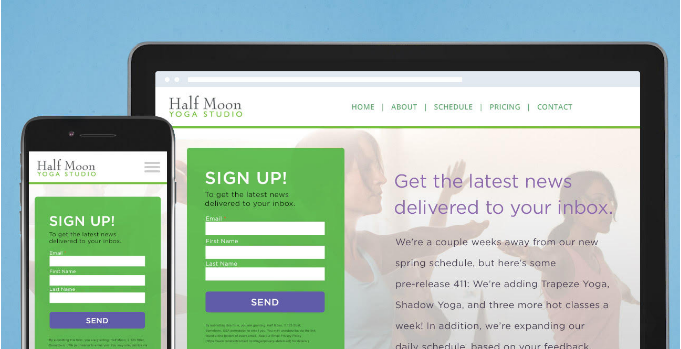 Popups, banners, and email bars are all available options for their mobile-friendly subscription forms. His customized splash page appears after visitors have spent three seconds on his site. Once website visitors sign up, Bryan sends an automatically scheduled Welcome Email to deliver a strong first impression. Learn more about Privy features and pricing here. Start turning your website visitors into email subscribers today! Get started by downloading Constant Contact Forms for WordPress today. With a sign-up form in place, make sure you have a plan to deliver a strong first impression with a winning Welcome Email. Have questions about these tools or other ways to grow your email list? Find more list growth resources here. Or ask us your questions in the comments section.